Sunday 6th April, 2014, at 17.55, is the occasion of the BNY Mellon Oxford and Cambridge Boat Race. With the finishing line a mere 20-minute train ride from 20 The Barons, St Margarets, our resident and ghostly expert The Baron (who has seen all 160 races) offers a 20-stroke guide to charting the waters of one of our oldest and greatest sporting events. 1. The race began as a challenge between former Harrow schoolmates Charles Merrivale (St John’s College, Cambridge) and Charles Wordsworth (Christ Church College, Oxford, and nephew of the poet William Wordsworth). 2. The first Boat Race took place on 10 June 1829, in Henley-on-Thames, and Oxford’s winning boat is preserved in Henley’s River and Rowing Museum. 3. Prior to the 2014 race, Cambridge had won 81 races, Oxford 77. 4. The only dead-heat occurred in 1877 when judge ‘Honest’ John Phelps reputedly declared the race a ‘dead-heat to Oxford by five feet’! 5. The current Championship Course was established in 1845, with the Boat Race becoming an annual contest in 1856, interrupted only by the two World Wars. 6. The Championship Course is 4 miles 374 yards, or 6.8 km, long, navigating a northward loop of the Tideway between Putney Bridge and Chiswick Bridge. 7. Oxford are the Dark Blues, the colour of Christ Church College who had five oarsmen in the original race. In 2014, the Oxford crew average 26 years, 13 stone 13 lbs, and 6 ft 3 ins. 8. 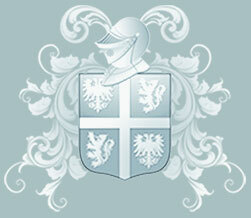 Cambridge are the Light Blues, the colour of an Eton ribbon tied to their boat in the second ever race. In 2014, the Cambridge crew average 24 years, 14 stone 7 lbs, and 6 ft 6 ins. 9. The Cambridge reserve crew are named Goldie after John Goldie, nineteenth-century Boat Club President. The Oxford reserve crew are named Isis after the stretch of the Thames that passes through Oxford. 10. Each boat has a crew of eight (the big ones) directed by a cox (the little one). Today’s boats have sliding seats, but until 1873 the same effect was achieved by oarsmen greasing the seats of their trousers. 11. The starting point is marked by a University Boat Race Stone set into the towpath on the southern bank just upstream from Putney Bridge. 12. The race is rowed upstream on the flood tide an hour before high tide, giving the crews the fastest possible water. 13. The Fulham / Chiswick bank is called the Middlesex side and its starting point the Middlesex station. The Putney / Barnes bank is the Surrey side and Surrey station. An 1829 gold sovereign is tossed to decide who chooses their starting station. 15. The Middlesex bank holds the shorter, inside line on the first bend. 16. 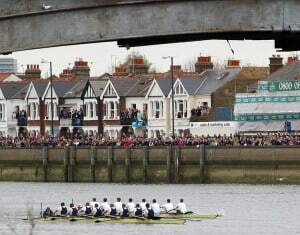 The Surrey bank holds the shorter, inside line on the long Surrey Bend after Hammersmith Bridge, a crucial part of the race. 17. At the end of the Surrey Bend, the crews approach Chiswick Eyot, an island nature reserve which marks the halfway point. 18. After Chiswick Eyot, the Middlesex bank holds the shorter, inside line on the final bend, where both crews must pass through the middle span of Barnes Bridge. 19. Just downstream of Chiswick Bridge, the finishing point is marked by a University Boat Race Stone on the Surrey bank (next to The Ship pub at Mortlake). 20. The course record, set by Cambridge in 1998, is 16 minutes, 19 seconds.